The Mail Center handles all of the primary incoming and outgoing mail and most of the domestic and international shipping needs for the Bowdoin community. Students, faculty and staff can use the Mail Center services. 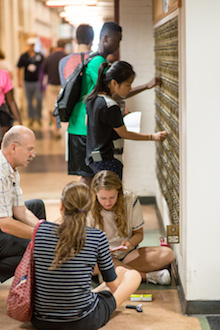 Student mail is delivered daily via their Smith Union mailboxes Monday - Saturday during the academic year. Faculty/staff mail is delivered to and picked up from departments daily, Monday - Friday, year round. Both ground and express shipping is available through a variety of carriers. Packaging materials including boxes, padded mailers, small, medium and large envelopes, bubble wrap and packing tape are available. A limited size range of free packing materials are available when shipping via FedEx (express) and U.S. Postal Service Priority Mail. In our commitment to help the environment, we also keep an ever-changing assortment of free, gently used boxes for your shipping convenience. Stamps are available in a variety of commonly used denominations.